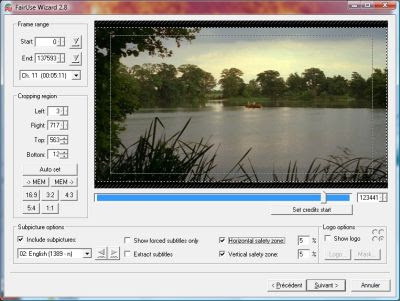 The full version of FairUse Wizard 2, a useful utility for converting DVDs to DivX or Xvid format files, is currently being offered as a free download. DivX compression will allow you to store more than one DVD on a single disc and Fairuse Wizard provides a viable means of backing up your expensive DVD collection. FairUse Wizard allows you to easily create movies that will play on your standalone player or computer with the DivX and XviD codecs as well as using H264 (iPod video) or the ffVFW codec suites. You can also encode up to two audio tracks so you can choose between original and dubbed versions at playback and you can preview subtitles on the preview screen during the encoding setup. The full edition is optimised to fully exploit Dual-Core, SMP, and Hyper-Threading CPU architectures, resulting in much faster encoding and has an auto-update feature not available in the light edition. Not sure why version 2 is being offered for free but I wouldn't be surprised to see version 3 pop its head up sometime soon so grab this one while you can.